I realize this is a pain for all of us. I really value the comments I get but I also want to be able to post photos. Without fighting with Blogger. I have a LOT to learn about Wordpress. Somehow, I have to figure out how to change the header picture. I'd never made booties before so I thought I'd give them a try. They were fairly easy to make and definitely didn't take much yarn - I still have some left (!) but this is the last thing I'm going to make in camo green. 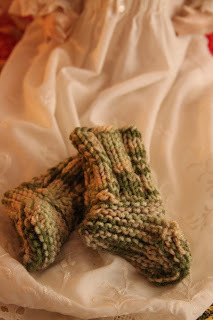 The pattern is a free one on the Lion yarn site. All the knitting pictures were taken on a doll I made years ago just to wear this dress. It's the christening dress I made that all my daughters and The Princess wore. I had yarn left after I finished the ribbed baby hat so thought I'd make another. I use circular needles so don't have to put in a seam. I don't like seams in hats - that's just not comfortable! This is size newborn (0-3 months). The directions would have been easy enough to come up with - I've made them for me without any - but this hat is in the book Itty Bitty Hats, which I have. 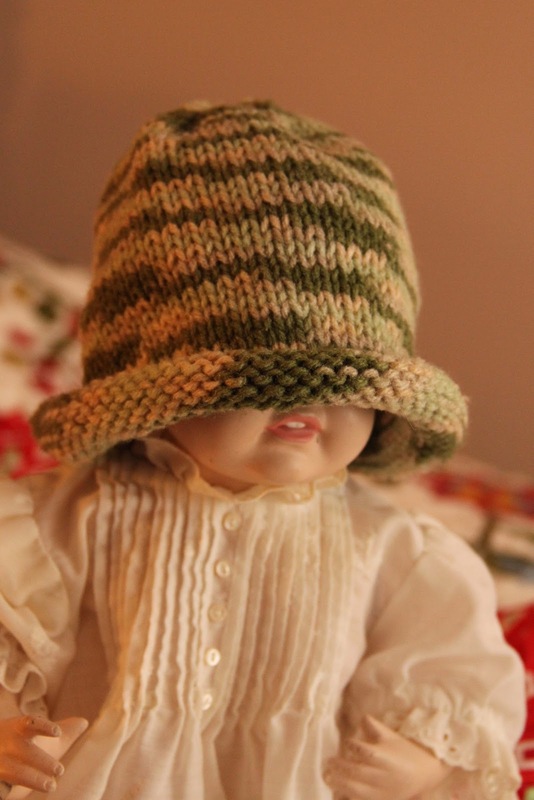 The book has some really darling hats for babies and small children and the directions are easy to follow. I'm trying to add pictures to a post but just get the message that I have no storage room left. Can anyone tell me how to get to my pictures so I can delete the old ones? I already have off-site storage and don't want to pay Google to store the same photos. I really need some help here! Thank you to anyone who can help me with this!!! EDIT: Thank you to Kathie, Dorothy, and Angela Lee. I deleted about 40 of my oldest posts and will resize the photos I post. Between the two fixes, I should be good to go for a while. And the picture I was trying to post is up. While pregnant daughter and I were shopping for curtain fabric for the nursery, she picked up a skein of yarn and asked me if I'd knit a hat for the baby. We talked about the style and she decided she'd like a ribbed hat since they'll stretch and it would fit longer. Next was figuring out just how big to make it without directions. We looked on the internet to find the average size head for a baby at different ages and we settled on the 3-6 month size. I really like these Little Bites quilts. They're the perfect size for a doll. When my grandchildren are here, they get a lot of use - good children always cover their dolls! I used French General's Chateau Rouge for this little quilt. This is the small version without the outer border. I didn't realize I had threads hanging off of it when I took the picture - my bad! I had a charm pack so cut the squares down. Be sure you visit the Schnibbles parade on December 1 at Sinta's and Sheri's. They do an incredible job each month posting all the photos. To everyone in the USA, have a happy Thanksgiving. I hope you have a wonderful day.